Manchester City will not pursue a move for long-time target Isco if he leaves Real Madrid, according to a report by Goal. 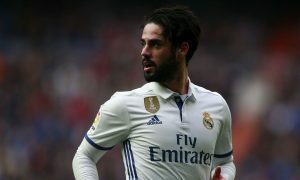 The annual Isco to City rumours have resurfaced in recent weeks, with the 26-year-old out of favour in Madrid and very much open to a move to Pep Guardiola’s City. But while it used to be a case of Manchester City wanting Isco more than vice versa, times have changed and Guardiola is said to have no real interest in signing the Real Madrid star. Guardiola sees Isco as neither the ‘No. 8’ midfielder or flying winger he would look to sign if he was seeking reinforcements in those positions, Goal reports. Should City’s view on Isco change, then Real Madrid could look to use their interest in Brahim Diaz – who is edging closer to a switch to the Santiago Bernabéu – to facilitate a deal. Isco will have no problem finding a big club should Madrid cash in on him either in January or the summer, but it doesn’t look as if the half-decade long flirtation between City and the Spain international will lead to them linking up.